It appearst to me that you have more people that want to adopt than puppies (all dogs are puppies to me) for adoption. That makes me very happy and with that in mind I will not join the crowd. Also, I noticed your adoption appplication requires things like a reference. Apparently you want to do a background on me by someone I don’t know, I don’t know their background so please excuse my being suspicious and reluctant to apply. A much as I love puppies and would be happy to take one with medical issues, I will continue to find local pound puppy when I am ready to adopt again. We are wanting to adopt a dog. My gigs have all crossed Rainbow Bridge and my stress n blood pressure has became quit high. Hoping to adopt soon. Dr is trying to get it under control but not working. This is the first we have been without a dog. We have had German Shepherds, Alaskan Malamute-Elkhound mix , Golden’s n Collie mix. Looking forward to hearing from you n what our next step would be. Was told there are dogs that did not pass the test available. Thank you so much. 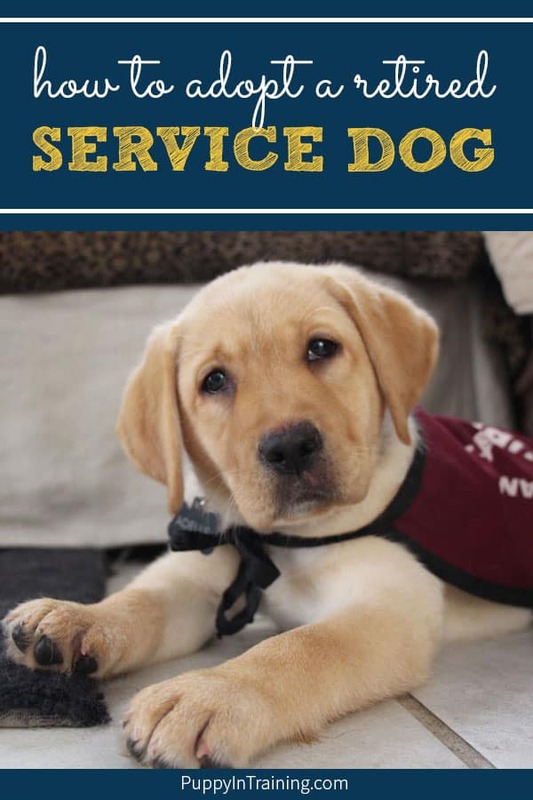 If you haven’t had a chance take a look at this blog post: https://puppyintraining.com/the-ultimate-list-service-dog-schools-with-adoption-programs/ We have a list of service dog organizations with adoption programs. Try contacting some of the organizations near your location to see if they have any available career changed dogs. Good luck with your search. Where can i get a retired or career changing dog for me … my dog is deceaased now best companion i ever had….i am in memphis tennessee…would prefer a female black (no poodle in them…I can handle a lab/chow mix, a shepard/chow mix anything medium to large…where do go? I a! looking for a retired lab out dog.. Our dog died last week and.I didn’t realize how l needed him for My PTSD..
My son has severe back problems and would like a dog to help him. He is in severe pain all the time. I would like to apply for a failed guide dog puppy. How do I do that?